On Monday, April 15th, the world watched with shock as the famed Notre Dame Cathedral caught fire and burned, causing catastrophic damage to the 850-year-old structure. Residents of Paris lined the Seine to watch the "Lady of Paris" burn. The crowed groaned as the famous spire collapsed. The structure is badly damaged but not a total loss, according to fire fighters in Paris. France's president Emmanuel Macron rushed to the scene on Monday and vowed to rebuild Notre Dame. Now, Salma Hayek's husband has stepped in to pledge $113 million to help rebuild the historic cathedral. "My father (François Pinault) and myself have decided to release a sum of €100 million from our Artemis funds to participate in the effort that will be necessary for the complete reconstruction of Notre-Dame." "As many others I'm in deep shock and sadness to witness the beauty of Notre-Dame turn into smoke. I love you Paris. Comme beaucoup d'autres, c'est avec effroi et tristesse que je regarde la beauté de Norte-Dame partir en fumée…Paris, je t'aime! Hayek and Pinault live near Notre Dame. They were married on Valentine's Day 2009 at the Sixth Arrondissement's City Hall, less than a mile away from Notre Dame. 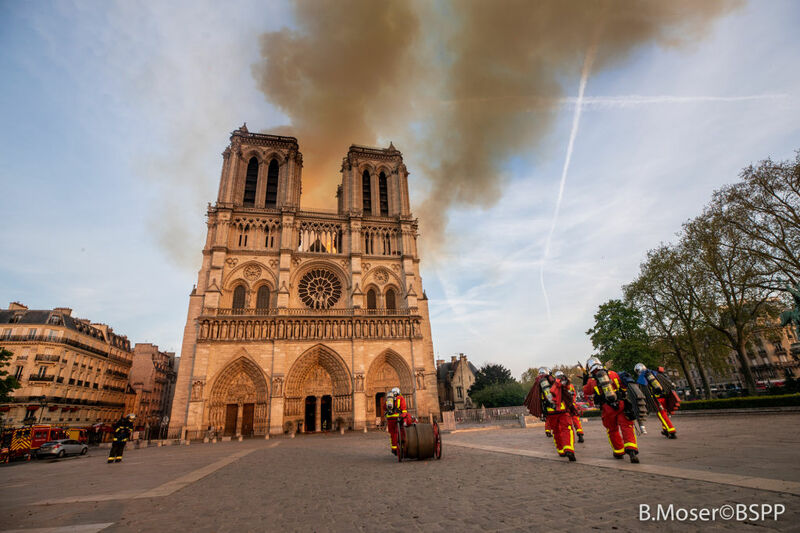 The fire erupted at 6:30pm Monday night local Paris time shortly after the cathedral had closed to tourists for the day. The famous spot sees 30,000 visitors each day. Pinault's pledge came after President Macron announced a public fundraising drive to rebuild the cathedral, which is a symbol of Paris and all of France. "It is with pride I tell you tonight we will rebuild this cathedral…we will rebuild Notre Dame because it is what the French expect of us, it is what our history deserves, it is, in the deepest sense, our destiny."